CHRIS MONTGOMERY TTN FILE PHOTO Junior Kacper Rams (front) and senior Filip Rams prepare for the serve. Due to injuries, only three players compete for the Owls at fall weekend invitational. 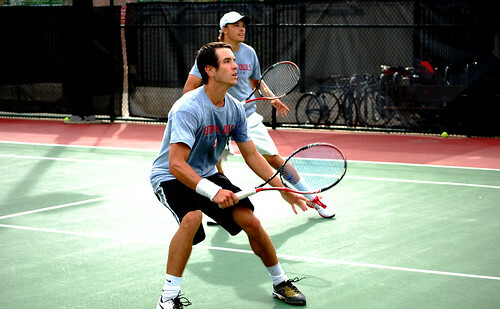 Men’s tennis was short-handed during the weekend as they took part in the Hofstra Invitational in New York. Junior Kacper Rams, senior Mansur Gishkaev and freshman Li Tang were the only players to suit up. Senior Filip Rams, who participated in the prestigious All-American tournament the previous week, decided to skip the Hofstra Invitational in order to fully recover from his previous matches. Coach Steve Mauro decided to rest sophomore Taylor Hairston, and senior Stanislav Stekolshikov was forced to sit out of this tournament due to an undisclosed illness. Kacper Rams, coming off his participation in the All-American tournament, and Gishkaev went all the way to the semifinals at Hofstra. Mauro said that he expects a lot from Kacper Rams. Mauro said he was also impressed with Gishkaev’s play and he is 35-16 in singles play and 23-20 in doubles play. His two partners last year were senior Dimitry Vizhunov (2-1) and Hairston (1-1). Li Tang, who is the only freshman on the Owls’ roster, had a sub-par performance as he is having some difficulty adjusting to the college level. Tang was knocked out of the tournament in the first round. Mauro said that Tang just needs more time to adjust and that he will one day be a “great player” for the Owls. But for now, Tang has room for improvement, Mauro added. Overall, Mauro said he was pleased with how the Owls played despite not having their team captain, Filip Rams, and their standout sophomore, Hairston. The Owls hope to be in full strength next week as they will compete in the Intercollegiate Tennis Association Regional Championships. Brian Kim can be reached at brian.kim@temple.edu. The Owls will return all of their players from 2013.